Encouraging kids to recycle at home is a great way for you to get some extra help around the house. When throwing out waste – ask your kids; if they think the item should go into the recycling or waste bin. Then ask them to pop it into the bin for you. Get the kids to help you pack their lunches. This is a good way for them to understand how you go about packing waste free lunches for them. Bring the kids to buy a reusable water bottle. There is a big emphasis on cutting down on using single-use plastics and bringing your kids to pick out a reusable water bottle is a great way to teach them about this. Make it even better for them and let them pick out a reusable water bottle with their favourite tv character on it, this will encourage them to want to use it and bring it to school! A great way to encourage your kids to recycle in the home is to let them up-style and decorate the indoor recycling bin. Let them use their imagination and encourage them to use recyclable materials such as old paper, toilet roll and bottle lids to dress up the recycling bin. Once decorated, they may even want to name it and create a running joke as to whether ‘bob’ the bin is full or needs to be recycled. Assist your child or children in doing up a checklist on what materials ‘bob’ takes and things that he doesn’t. This will help to instil a lasting memory of the correct recyclable materials. If the home recycling bin is not suitable to dress up, why not get each child their own little bin or box for recycling and let them decorate it instead. 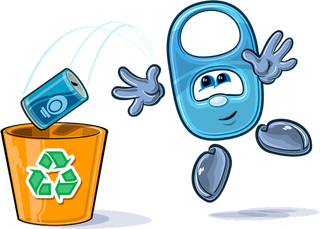 Create a friendly competition to encourage them to recycle the appropriate materials with an award for the most recycled items or the most correctly recycled items. It is a great way of helping them to learn the do’s and don’ts of recycling. You could even have a points scheme with the winner getting a small prize at the end of each week/ month to help motivate them. Everyone can be a winner if recycling is done correctly! Food waste can also be used to improve soil quality and act as a fertiliser for plants.